3 Cups of Coffee® was featured in the Pittsburgh Post-Gazette! Click the photo to read the story. All it takes is 3 Cups of Coffee ® to wake up your career! 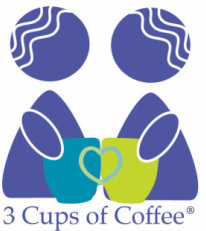 3 Cups of Coffee ® is a short-term mentoring program that matches women who are job-ready with a volunteer mentor. They meet three times for one-hour conversations in a local coffee shop or café. Together, they create a customized plan that identifies career goals and job possibilities while building networking connections. Corporate partner Crazy Mocha provides free coffee and a relaxed meeting space for 3 Cups of Coffee ® mentoring pairs. Mentors provide a wealth of experience, knowledge, and networking connections to help mentees land – and succeed in – the perfect job. For more information about this program, please contact Taneshya Williams, Program Manager, at twilliams@pawomenwork.org or 412-904-1345. To watch our short documentary and 30-second public service announcement about 3 Cups of Coffee, click here! 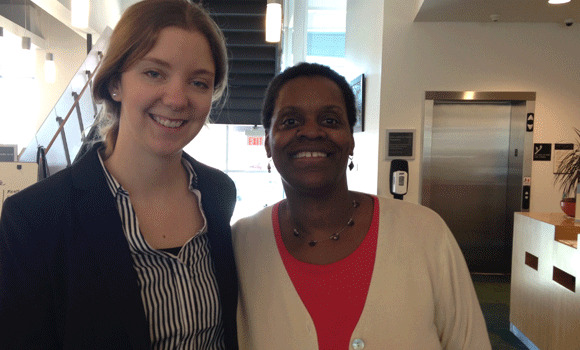 Sarah Minney, mentor, and LaShaun Martin, mentee, say they both benefited from 3 Cups of Coffee®. "LaShaun Martin of East Liberty found herself a homeless military veteran last year after bravely removing herself from a domestic violence situation. Resolving to find employment and permanent housing, Martin applied applied to be a part of the 3 Cups of Coffee mentorship program. She was paired up with Sarah Minney, an employee of UPMC’s Western Psychiatric Institute and Clinic, as Minney was working in the social services field, which Martin wanted to enter. Together, the women chose to target the Pennsylvania Department of Education’s Allegheny Intermediate Unit (AIU) as Martin's employer of choice and prepared her for the job search. Just a couple weeks later, Martin was recruited for the perfect position: a personal care assistant for special needs children at the AIU’s Sunrise School in Monroeville. She applied, interviewed, and was hired." Read more about LaShaun's story and how 3 Cups of Coffee® benefits both the mentors and the mentees here. Pennsylvania Women Work is pleased to partner with Crazy Mocha on this initiative. Crazy Mocha has generously agreed to provide vouchers for coffee to mentors and mentees involved in the program, as well as allow mentorship meetings to take place at their locations in the City of Pittsburgh. Thank you, Crazy Mocha! This program is funded in part by FedEx Ground, Peoples, the Jack Buncher Foundation and the J. Jill Compassion Fund. ​Pennsylvania Women Work is grateful for their support! I want to find out more about Pennsylvania Women Work's programs!